The 2018 TITAN XD Single Cab is offered in S and SV grade levels with a choice of diesel or gasoline powerplants and in 4x4 and 4x2 drive configurations. TITAN XD Single Cab S models are equipped with a front manual split bench seat (40/20/40), flip-down center seat with armrest, a 5.0-inch color display, Streaming audio via Bluetooth®, Hands-free Text Messaging Assistant, a 4-speaker audio system, easy-clean vinyl floor and stain-resistant cloth seats with vinyl bolsters. TITAN XD Single Cab SV models add cloth seats (without vinyl bolster), standard floor carpeting, analog Fine Vision Meters, SiriusXM® Satellite Radio (SiriusXM® subscription required, sold separately), chrome outside door handles, side mirror turn signal lamps, 18-inch aluminum-alloy wheels and Trailer Sway Control. 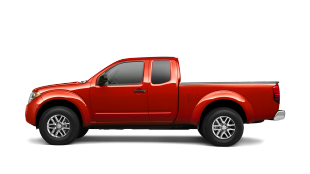 Nissan TITAN XD starts with a focus on commercial strength components – from the radiator to the rear axle and everything in between. 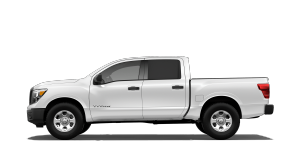 Every TITAN XD model is built on a unique frame and chassis (compared to the TITAN half-ton) to handle the Cummins diesel and Endurance® V8 gas engines, as well as the truck's expanded towing and payload potential. Utilizing a durable, proven chassis design from Nissan Commercial Vehicles, the fully boxed, full-length ladder frame is extensively reinforced and strengthened for use with the TITAN XD with added stiffness, vertical and lateral bending, and torsional rigidity. 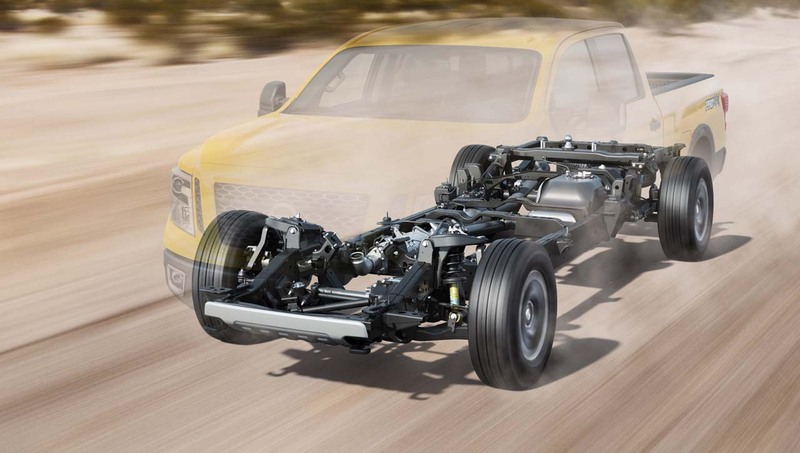 It also features an extended 151.6-inch wheelbase – about 20 inches longer than TITAN half-ton models. To maximize stability, handling and ride comfort, TITAN XD uses a heavy-duty, highly stable suspension design. The double-wishbone with stabilizer bar front suspension is reinforced and tuned for hard use, and the rigid rear axle suspension utilizes hefty leaf springs and leaf bushings, along with twin-tube shock absorbers. The axle is a large purpose-built American Axle Manufacturing design. The rear differential measures 9.84 inches with 3.5-inch axle tubes, while the front differential (4x4 models) measures 9.25 inches. Both are manufactured by American Axle. Also available is an Electronic Locking Rear Differential. 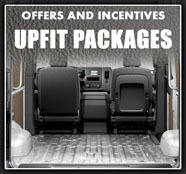 Hydraulic cab-mounts help isolate occupants from the advanced TITAN XD chassis. The TITAN XD rides on 17-inch, 18-inch or 20-inch aluminum-alloy wheels with LT245/75R17, LT275/65R18 or LT265/60R20 tires for strong all-weather/all surface traction. Braking is provided by a 4-wheel disc system with 14.2 x 1.5-inch front/14.4 x 1.2-inch rear ventilated discs front and rear with hydraulic power assist. The high brake fluid pressure generated by an electric pump assists brake pedal force for a confident feel. Responsive steering is provided by a recirculating ball-type high-capacity steering system with parallel rod steering linkage to optimize steering effort characteristics, even under heavy axle weight and towing conditions. Even the radiator's heat radiation cooling capacity is engineered to help enhance performance and meet SAE J2807 compliance. TITAN XD engine capacity meets 12,000-plus pound tow requirements through use of the large radiator, air transmission cooler and large 23.6-inch engine cooling fan diameter. 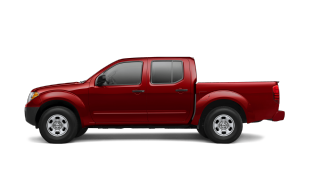 The 2018 Nissan TITAN XD is offered in three body configurations. 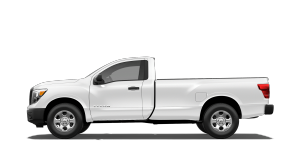 TITAN XD Crew Cab features four wide-opening doors and a 6.5-foot bed. 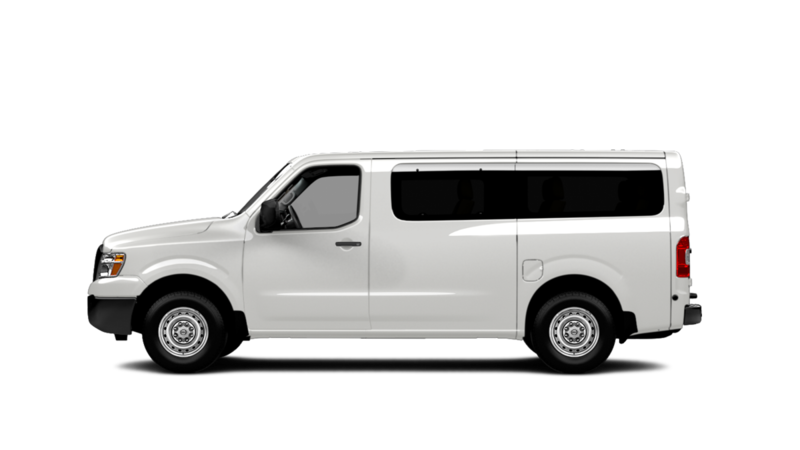 TITAN XD King Cab includes with 172-degree wide-opening rear doors for easy access to the rear seat, while the TITAN XD Single Cab offers two doors and an 8.0-foot bed. Inspired by a theme of ''powerful precision tool,'' the TITAN XD exterior provides a bold, commanding presence with a fresh, modern technical feel. 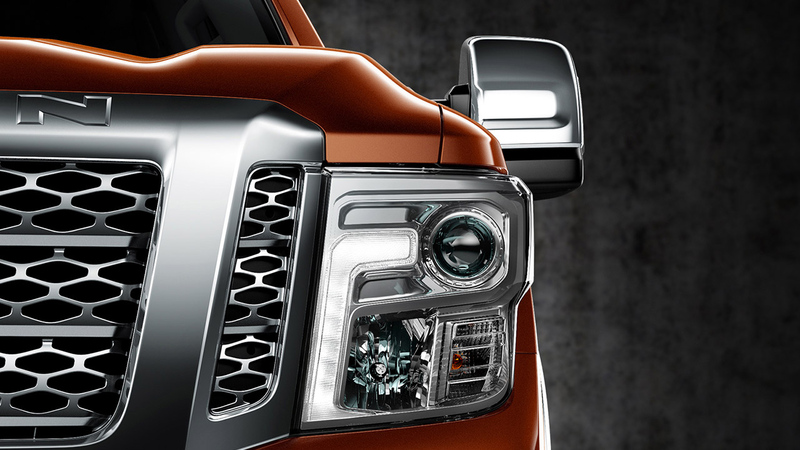 The designers sought to give TITAN a feeling of athletic strength – a look that honors the power of the Cummins diesel and Endurance V8 engines. The profile of the TITAN XD, with its extended front overhang, was actually influenced by the engine, to incorporate the high performance grille, charged air cooler and two-battery installation. 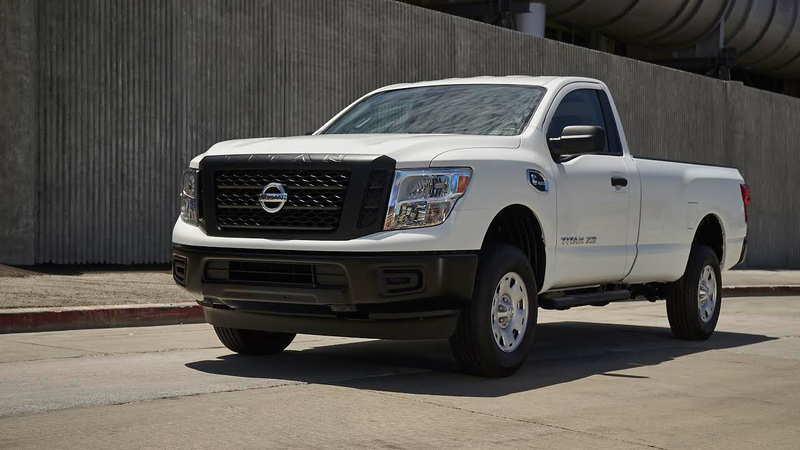 Aerodynamics also played a role in the exterior design, which is improved from the previous Titan and incorporates a front spoiler, roof and tailgate spoilers, front tow hook hole cover, underbody covers, rear tire wind deflectors and a seal between the cab and bed. 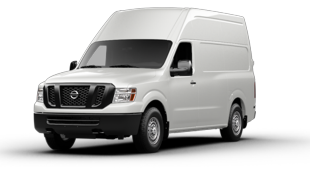 Available exterior features include LED headlights and taillights, signature Daytime Running Lights, puddle lamps, and step rails for cabin and bed entry/exit. TITAN's industry-first Utili-track® Bed Channel System features four heavy-duty aluminum alloy cleats that move and lock anywhere along the walls, bed floor and header tracks that give the user endless tie-down possibilities. TITAN XD also features available dual lockable in-bed ''TITAN Box'' storage boxes that sit sight-unseen at street level and can hold a wide range of essential work and recreational equipment. 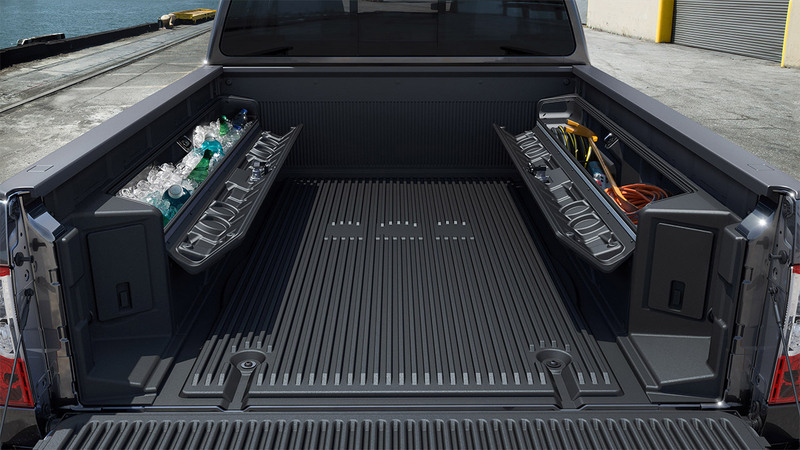 Unlike other pickup bed storage boxes, the TITAN XD units are accessible from inside the bed without having to remove a camper top or tonneau cover. The boxes are watertight (and drainable) and can be used as a cooler for picnics or tailgating. They are also easily removable for times when extra bed capacity is required. 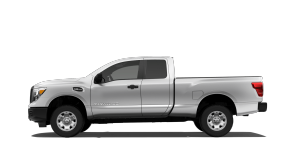 Other TITAN XD bed features include the popular spray-on bedliner, flush-mounted LED bedrail lighting, cargo and tailgate lamps, 110-volt in-bed access and a damped tailgate that is light to lift and smoothly damped when lowering. 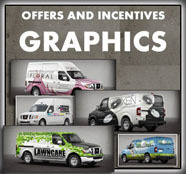 Trucks today are multi-functional, used as work and everyday vehicles – so the interior has to be multi-functional as well. The designers focused on enhanced utility and on making the interior easy to use through an improved layout of switches, driver controls and storage spaces. The 2nd row underseat storage, for example, includes a locking lid for added security and the integrated foldout flat floor. The center console can hold a computer tablet with case or a 15-inch laptop. All switches are grouped by function type and location is based on frequency of use. Other convenient interior design features include seven assist grips, console-side map pockets, 12-volt and 110-volt power outlets (in addition to the bed), Remote Engine Start3 with climate control function, and Rockford Fosgate premium 12-speaker audio system. The special attention to detail even includes moving the glove compartment handle to the left hand side for easier access by the driver. The TITAN XD also features a tilt and telescoping steering column with a standard column-mounted transmission shifter lever – a move that helps increase the visibility and usability of the center stack area. This also opened up the center console for additional storage, allowing riders to fit a laptop in the center console without giving up rear cupholders and 2nd row climate control vents. 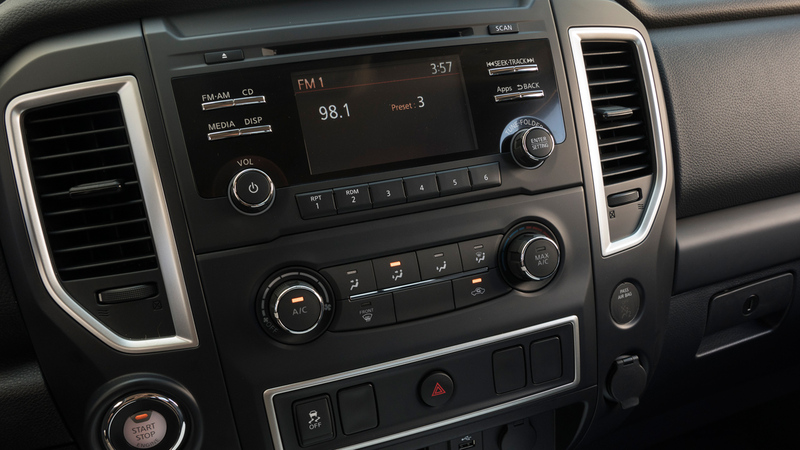 The premium grade instrument panel includes a combination of analog and digital gauges, along with a 5.0-inch color display, unique diesel monitoring and maintenance displays, and available NissanConnectSM with Navigation and Mobile Apps and NissanConnect Services with 7.0-inch color monitor (SiriusXM® subscription required, sold separately). As in other Nissan vehicles, TITAN XD offers seating inspired by NASA. The standard front and rear Zero Gravity seats help maximize posture positioning for enhanced comfort during long distance driving. Heating and cooling front sears are also available, along with a choice of water-repellant fabric or durable leather-appointments. 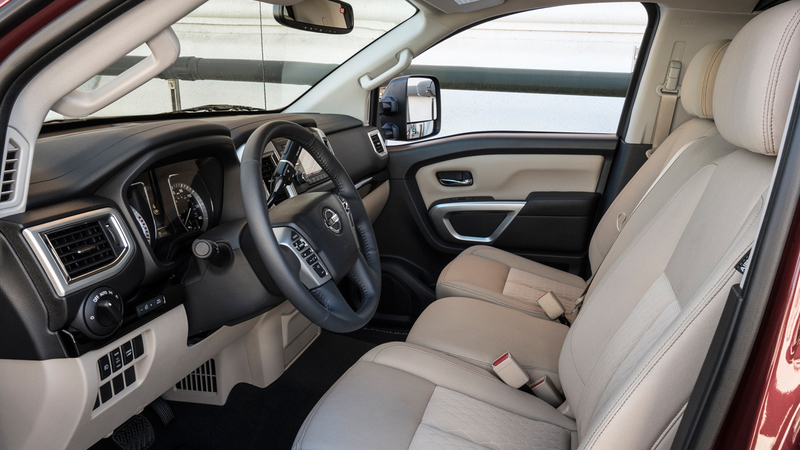 Heated front and rear seats are available in both cloth and leather trim levels. Special attention was also paid to reducing the intrusion of noise and vibration into the cabin. 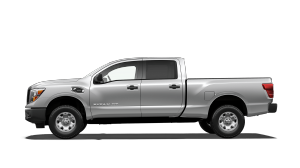 TITAN XD utilizes laminated front and rear (Crew Cab) side glass, the first full-size pickup to do so. Engine noise isolation and body sealing was also improved versus the previous generation TITAN design. 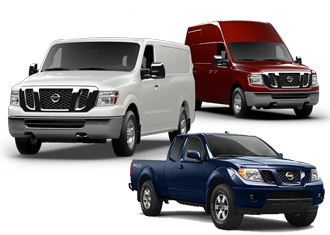 Creating a new class of truck also meant developing a new class of engine. 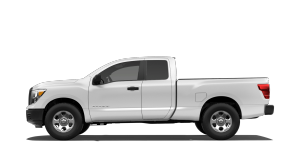 Like the TITAN XD itself, the Cummins 5.0L V8 Turbo Diesel fills the space between more expensive big bore diesels and less capable smaller displacement diesels. And more than just power and torque, the engine is refined, starts fast and is responsive and quiet. It is also lightweight and offers clean emissions. The TITAN XD's Cummins diesel features the Cummins M2 two-stage turbo system, which helps reduce traditional turbo-lag through precision balancing between high-pressure and low-pressure turbos. The patented Rotary Turbine Control provides solid performance across the powerband and manages exhaust gas temperatures. The engine also includes a Bosch® HPCR fuel system to deliver precise fuel control and multiple injections per combustion stroke, which helps increase efficiency and reduce traditional ''diesel clatter.'' And, the advanced, maintenance-free Bosch® ceramic glow plugs provide quick engine starts, even in extreme low temperatures. Another key advantage of the Cummins diesel design is that it provides maximum durability and power in a lightweight package. Weight was reduced by building the cylinder block out of compacted graphite iron (CGI), which is stronger and lighter than traditional iron. Other lightweight engine components were added, including high-strength aluminum-alloy heads and composite valve covers. The CGI block, along with the dual overhead camshafts, also contributes to the engine's excellent noise, vibration and harshness (NVH) characteristics. The Cummins 5.0L V8 Turbo Diesel exhaust system has a particulate filter and selective catalytic reduction that enable the engine to run cleaner. That technology also serves a second purpose – reducing typical diesel noise. As a result of all these advanced systems, the Cummins 5.0L V8 Turbo Diesel is more capable than small displacement diesel engine offerings and less expensive than big bore heavy-duty diesels. It is also designed to be fun to drive, with about 45 percent more torque at cruising speed than similar-sized gasoline V8 engines. 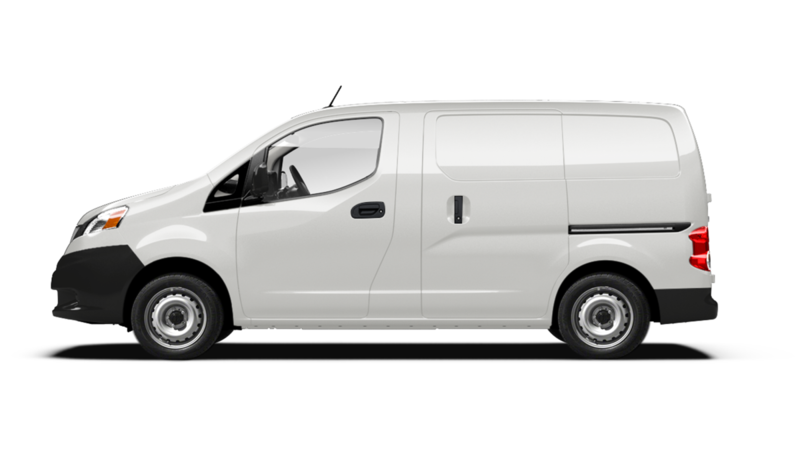 And, its low revving powerband requires less downshifting and provides more confidence while towing, as well as saving fuel whether towing or carrying heavy loads. Helping handle the power and torque of the engine is a heavy-duty 6-speed Aisin A466ND automatic transmission developed and tuned exclusively for the TITAN XD. TITAN XD models equipped with the 5.0L Cummins diesel have a maximum payload of 2,420 pounds (when properly equipped) and a maximum towing rating of 12,640 pounds (when properly equipped). 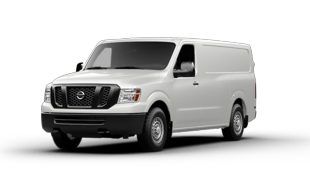 Equipped with the 5.6L Endurance gasoline V8, maximum payload is rated at 2,910 pounds (when properly equipped) and a maximum towing rating of 11,590 pounds (when properly equipped). 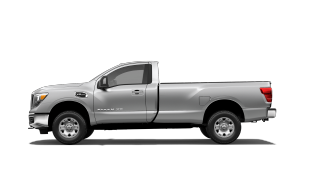 Among the list of TITAN XD's available towing aids are an Integrated Trailer Brake Controller, Trailer Sway Control (TSC), Tow/Haul Mode with Downhill Speed Control and a Trailer Light Check system that allows one-person hook-up operation – checking turn signals, brake lights and running/clearance lights from inside the TITAN cab or with the key fob. Also assisting trailer hook-ups is the TITAN XD's available RearView Monitor with Trailer Guides, while the available Intelligent Around View® Monitor (I-AVM)2 provides a composite ''bird's eye'' view of the surrounding area from front, rear and side cameras to help with parking and pulling in and out of tight spaces. 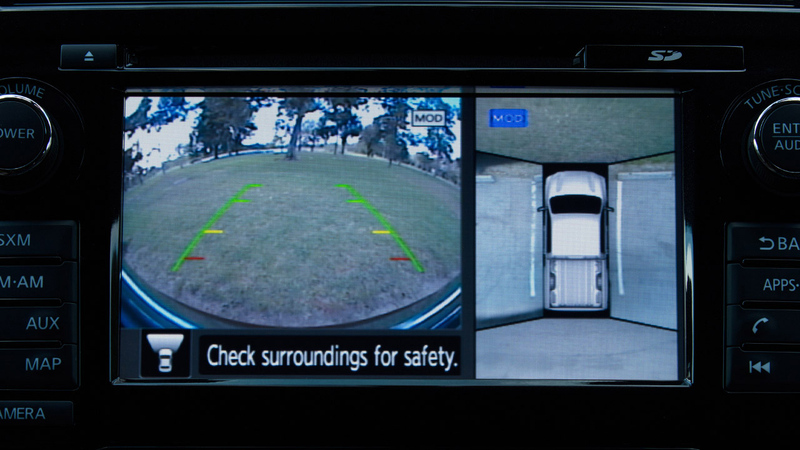 The system also includes Moving Object Detection (MOD), which helps alert the driver to detected moving objects around the vehicle via an on-screen notification and warning chime. Helping TITAN XD owners take advantage of its ample towing power are a range of available hitches – including an integrated gooseneck hitch engineered into the frame and easily accessible in the bed. 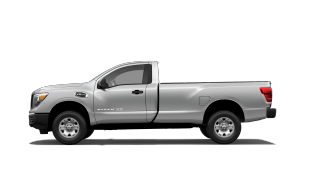 Gooseneck hitches put the load in front of the rear axle, enhancing the ability to control the vehicle. 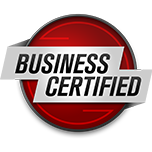 The 2018 Nissan TITAN XD meets the J2807 certification's standards. TITAN XD also includes a range of available advanced driving aids, including Blind Spot Warning (BSW), Front and Rear Sonar System and Tire Pressure Monitoring System (TPMS). Actual mileage may vary with driving conditions – use for comparison only. I wanted to KoooDooo Share this cool website link with you. 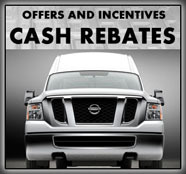 Let me know what you think: http://roundrocknissancommercialvehicles.com/new.vehicles.php?mdl=nisstixs2018.